May, 2008: This deck may return in Fall, 2008. Please check back at that time. Measurements: 2.8 x 4.7 inches, or 70 x 120 mm. Back of card: A white border, inside a mostly dark blue diagonally streaked sky full of stars. In the lower right quadrant, a small golden bird in flight. Can be inverted if you're not fussy. Booklet included: Yes, 108 pages, 2.7 x 4.65 inches, or 68 x 118 mm. One of the largest & fanciest of the little booklets. This one is perfect bound, which means the bound side is square, like a regular book. While illustrations are limited to simple diagrams of card layouts, the descriptions of the cards are healthy. Publisher: AGMuller. Cards printed in Switzerland. 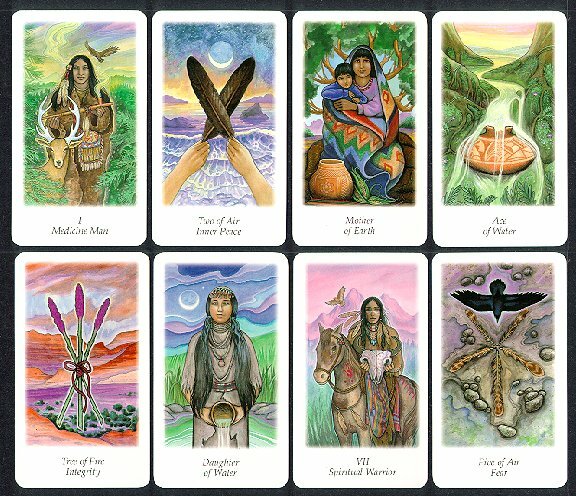 Clown, Medicine Man, Medicine Woman, Grand Mother, Grand Father, Shaman, Lovers, Spiritual Warrior, Balance, Hermit, Small Medicine Wheel, Life Force, Vision Quest, Transformation, Integration, Torment, Chaos, Star, Moon, Sun, Spirit Guide, Big Medicine Wheel. Suits are Water (cups), Fire (wands), Air (swords), and Earth (pentacles). Court cards are Father, Mother, Son & Daughter. All four of the number three cards are called "Trees", such as the Tree of Fire (3 of Wands, above), etc. This is presumably derived from the word, "trey", an old name for the three of pips (the word derives from the French & back to Latin). Oddly enough, the booklet pointedly calls these cards the Three of Water, Three of Air, etc., and does not actually describe what is on the cards themselves. This may have happened in the translation. The booklet was originally written in German, it was translated by Mascha Rabben in Los Angeles. If the translator never saw the cards themselves (which is possible), then she cannot be at fault. But since there are no accidents, we may think of these cards as both trees & threes, with the delightfully mixed messages that result. A note on the art: There seems to be only one face in this deck, a female with beautiful eyes. It's made to do service for men, women, children & infants. In most cases it's shown square on to the viewer.